We feel proud to bring forth our respected clients with an innovative array of Intricately Carved Front Door for Resort. Our front door is customized in different designs as per the need of patrons. Offered front door is well known among customers for its durability & design. The given front door is checked on numerous parameters in order to deliver a flawless range. Customers can purchase this front door from us at market rates. 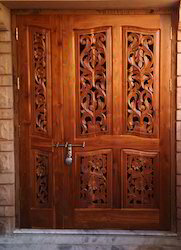 The offered CARVED FRONT DOOR is in TEAK WOOD.Ready to use FRONT DOORS are offered by ALPA CORP from INDIA. Front doors, Exterior doors are manufactured with a wide options available with us in wood like Indian rosewood (Hindi- Sheesham), Teakwood (Hindi- Sagwan), Mango wood (Hindi- Aam), Acacia wood (Hindi- babool).Front door, exterior door is available in various finishes/ shades/ Polishing like Melamine, Matt liqueur, Gloss liquor brown, black, Light honey, dark honey and customized shades as per client's instruction.Hardware options for Front door, exterior door are available with us to choose in brass, steel. Hydraulic hinges provides a smooth opening and closing for the door. Front door can also be provided with modern locking systems as per client's instructions and availability in the market.For more details and customized offer for door, exterior door, front door, carved door, door with frame, frames feel free to write or call. Ready to use FRONT DOORS are offered by ALPA CORP from INDIA. Front doors, Exterior doors are manufactured with a wide options available with us in wood like Indian rosewood (Hindi- Sheesham), Teakwood (Hindi- Sagwan), Mango wood (Hindi- Aam), Acacia wood (Hindi- babool).Front door, exterior door is available in various finishes/ shades/ Polishing like Matt liqueur, Gloss liquor brown, black and customized shades as per client's instruction.Hardware options for Front door, exterior door are available with us to choose in brass, steel. Hydraulic hinges provides a smooth opening and closing for the door. Front door can also be provided with modern locking systems as per client's instructions and availability in the market.For more details and customized offer for door, exterior door, front door, carved door, door with frame, frames feel free to write or call. Under the strict supervision of professionals, we are offering an exclusive range of gamut of White Solid Wood Door that gives the royal touch to interiors. Our door is customized in different designs as per the need of patrons. 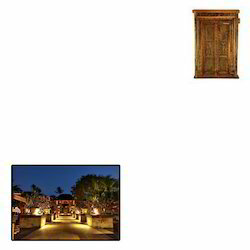 Offered door is well known among customers for its royal look. The given door is checked on numerous parameters in order to deliver a flawless range. 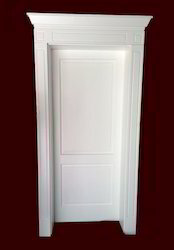 Customers can purchase this door from us at market rates. Front door can also be provided with modern locking systems as per client's instructions and availability in the market.For more details and customized offer for door, exterior door, front door, carved door, door with frame, frames feel free to write or call. Very fine carved front door from India. The door has perforated screen on both the side which provides an elegant heritage and royal look. Customized door sizes and designs can be done as per client's instruction. For a customized quote feel free to write or call. Antique Architectural Bakhra Carved Brass Fitted Door. old occasional doors. 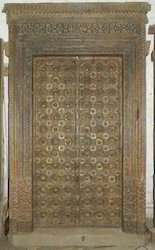 carved doors with brass fittings. Looking for Solid wood doors ?